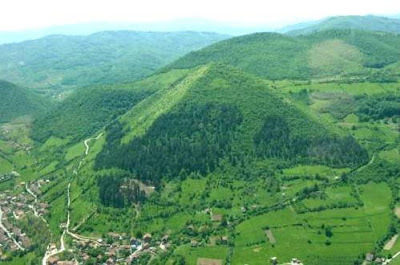 Near Visocica hill overlooking the town of Visoko, 30 kilometers [18 miles] northwest of Sarajevo, There is a huge hill with the shape of a pyramid, according to Semir Osmanagic, an amateur researcher, the hill has four perfectly formed slopes. IS THIS REALLY A PYRAMID? Entitiy that came to dialogue: Master Ruanel. Interlocutor: The so-called Bosnian pyramids, which are so polemic, Were they built by extraterrestrials? Ruanel: In that place there were extraterrestrial bases from Bellatrix. Interlocutor: The same race of Aliens who intervened in the Pentagon attack? Ruanel: Correct. Notice that there are many extraterrestrial bases in the planet Earth that at the present time are deactivated. Most of them -I’m not saying in all of them- the aliens have taken the whole equipment abandoning the structure without leaving tracks from their presence to possible researchers. Interlocutor: The same thing that the aliens who built the pyramids of Egypt when they dismantled all of them? Interlocutor: I won't ask about Bellatrix because we already have information about them, but I will ask when they came. Ruanel: More than ten centuries ago. Did Interlocutor: And Did they build the pyramids in that time? Ruanel: Correct, we are speaking of the year 1000. There are some pyramids that were built on the other side of the Andes Mountain range, closer to Peru and they were built in that same periodo f time also. These pyramids are newer than the Mayan, Incan and Aztec pyramids, which were also built by these beings from Bellatrix. From the mountain range to the sea, closer to Peru. Interlocutor: Let’s see if I understood well. Those pyramids in Peru are on the other side of Los Andes mountain range? Ruanel: Correct, they are on the mountain range towards the sea, closer to Peru. Interlocutor: Now, I did understand. I will try to find information about this info if it exists. Were all The pyramids of Egypt teletransporting machines? Ruanel: All of them, of course, otherwise which would be the purpose of building them? Ruanel: Yes, because there were contingents that constantly came back and forth. Interlocutor: Is that easy then to build teletransporting machines? Ruanel: For them it was. Interlocutor: And the famous Sphinx? I mean if it was simply a similar monument like the ones we build for example an obelisk. Interlocutor: No religious or esoteric interpretation or something like that, then? Ruanel: No, not at all. Notice that most of the planets, except for the underdeveloped planets, they don't have what you call "religion." Ruanel: No, and the technological planets don’t even think about it. Interlocutor: I am surprised, because I thought that religion was something like the aspirin that exists in all the worlds. Ruanel: There are planets like Aldebaran 4, which is a planet that is permanently in Middle Ages, and some regions are in Ancient Age, where they do have religion. Interlocutor: Do you say concretely that advanced planets don't have religion? Interlocutor: I assume that the Earth, with many different religions, it is an extremely underdeveloped planet. Ruanel: The Earth is one of the few planets that is advanced technologically and still continues having religion. This is the strange thing about Sun 3. Interlocutor: I understand. Do we know exactly when the pyramids of Egypt were built? I ask it because I don't remember if I have the information directly from the Masters of Light. Ruanel: Not less than 10.000 years. The aliens from Orion 3 had a lot of work in that time. This entry was posted at Wednesday, September 02, 2009 and is filed under Mysteries and Enigmas . You can follow any responses to this entry through the .